Slightly smaller than the White Stork. Distinguished by the black head, neck, chest, upperparts and tail, with metallic green or purple gloss visible at close range. In flight, almost all of the underwing is black, with a white triangle near the body. The upper side is completely black. The bill and legs are red in the adult and greenish-brown in the immature. The black areas are also duller in the immature. Voice: “yiu”, similar to the calls of a raptor. “Ski-luu, ski-luu”, like sharpening a saw, has also been described at the nest. L. 90-105 cm ; W. 175-202 cm. 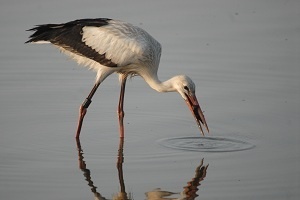 Similar species : White Stork. Very large with long legs and a long neck. Remiges black, rest of the plumage almost completely white. Bill and legs bright red in the adult and dull red (with the tip of the bill black) in the juvenile. Silhouette and colouration distinctive in flight: long neck extended, black remiges contrasting with the white wing-coverts and body. L. 95-110 cm ; W. 183-217 cm. 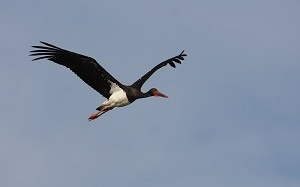 Similar species : Black Stork, Great White Pelican flying. Dark with a curved bill like a curlew, long legs and a long neck. The plumage is dark purple-brown with a green gloss on the wings. 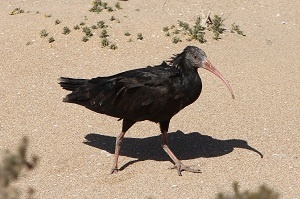 Distinguished from the Bald Ibis in flight by the legs extending well beyond the tail, the narrower wings and a longer neck. The wingbeats are also faster and more mechanical-looking. Does not glide. Adult breeding: base of the bill blue with a narrow white border. Uniform dark on the head and neck. Adult non-breeding: like adult breeding but the head and neck are duller, finely speckled with white. Base of the bill dark. Juvenile: like adult non-breeding but browner, without the green and purple tints. Voice: in frequent grunting “grrru”. L. 55-65 cm ; W. 88-105 cm. Similar species : Bald Ibis, Sacred Ibis. 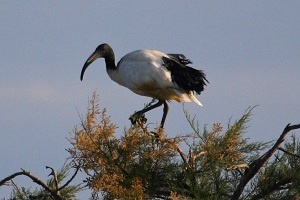 Larger than the Glossy Ibis and more solidly built. Black, short-legged, long tail and curved bill. Plumage black with metallic purple-brown and green gloss. Bill and legs red. Head unfeathered with red skin. Nape feathers elongated and drooping. The juvenile has a dark head, more or less feathered. In flight, the wingbeats are powerful and flexible and Bald Ibis glides in flight. The neck is short and thick and the legs do not extend beyond the tail. Voice: croaking “rruoop” and a short “brump”. L. 70-80 cm ; W. 120-135 cm. Similar species : Glossy Ibis, Sacred Ibis. Larger than Glossy Ibis. Black and white with the bill sturdy and decurved. Bill, head and neck (unfeathered) black. Legs dark brown. Tertials bushy, black. In flight, the wingtip is black. The juvenile is distinguished from the adult by the feathered head and neck, with variable proportions of black and white. L. 60-85 cm ; W. 110-125 cm. Similar species : Bald Ibis, Glossy Ibis. Unmistakeable due to its long bill with spatulate tip. Could be mistaken at long range for a Great White Egret due to its size and white plumage. 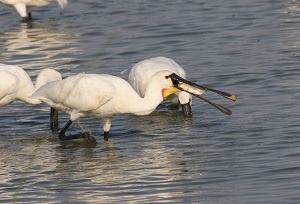 Distinguished by its feeding methods, with the bill submerged in the water and the head moved from side to side as the bird moves forward. The adult also shows a bushy crest. Also in comparison with the Great White Egret, at rest the body looks rounder and is held more horizontally. Flies with the neck extended, unlike herons. Adult breeding: conspicuous crest. Yellow patch on the chest, bill black with a yellow tip, remiges white. Legs black. Adult non-breeding: like adult in breeding plumage but with no crest and no patch on the chest. Juvenile: like the non-breeding adult but tips of remiges and primary coverts black, bill and legs flesh-coloured. L. 80-93 cm ; W. 120-135 cm. Similar species : Great White Egret.